All aboard! 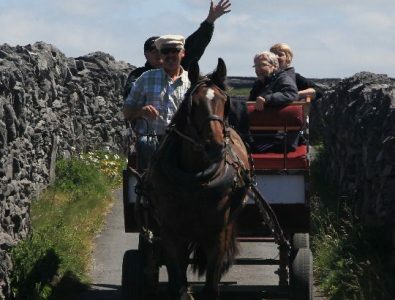 What better way to spend a day in Doolin, than on a day trip to the Aran Islands. 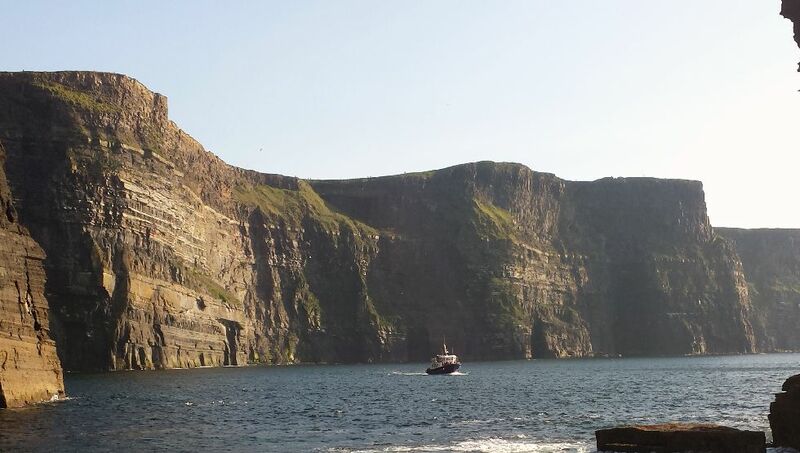 Okay, maybe a boat trip AND a cruise to the Cliffs of Moher would top that… well then, you’ve come to the right place! 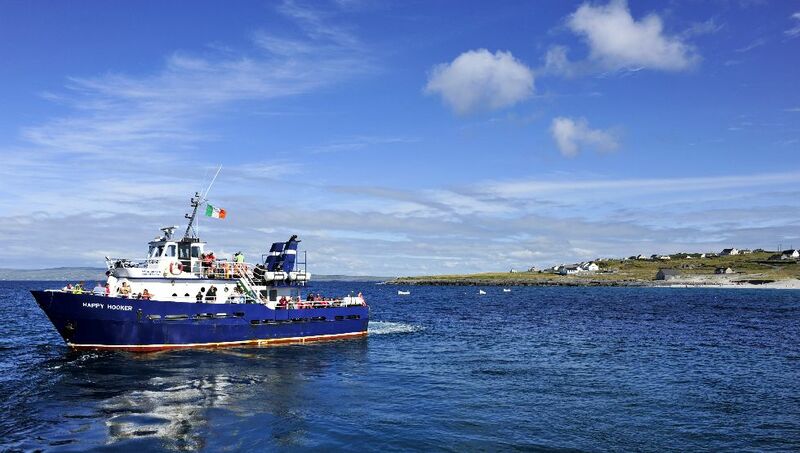 At Garrihy’s Doolin2Aran Ferries, we will do our best to help you make the most of your boat trip. 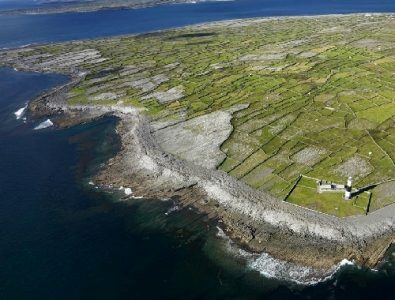 A trip to the Aran Islands (Inis Mor, Inis Meain and Inis Oirr) offers an escape back in time where the pace of life is slower, scenery is awe-inspiring and ancient history is visible at every turn. 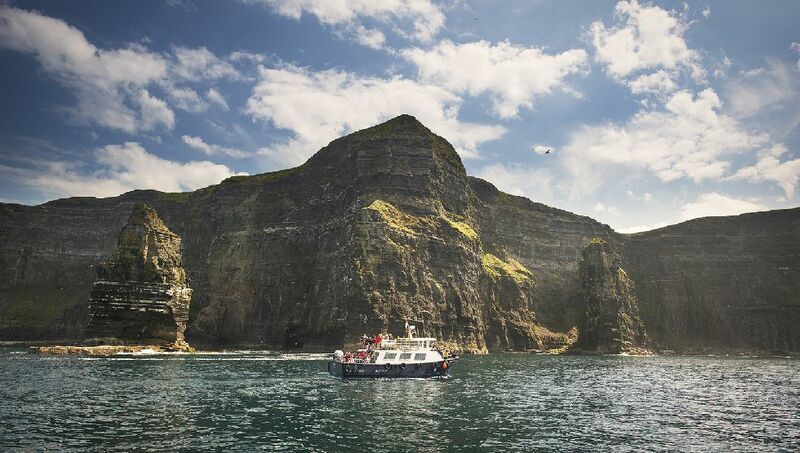 The Cliffs of Moher cruise will simply take your breath away as you take in their sheer size towering above the boat and watch their seabirds fly. Planning ahead will just make your day even more perfect. The first thing to consider is how much time do you have for your trip. 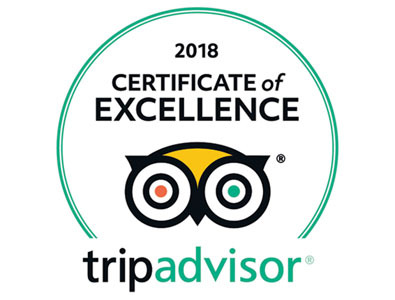 The second thing is to Book Ahead so you are not disappointed. You can also book at our ticket offices located on Doolin Pier and in the main Doolin Tourist Office in the Hotel Doolin complex. Our friendly team can discuss your options in more details with you. Click here for our blog with directions and parking information. So, decide how long you want to spend on your trip and read on to see what’s the best choice for you. Lucky you! You are spoiled for choice. Take a trip to any one of the three islands (you can only visit one island per day). Inis Oirr is the smallest and closest to Doolin, Inis Meain is the quietest, most unspoiled and Inis Mor is the largest and furthest from Doolin, famous for its Dun Aengus fort on 300ft cliffs. 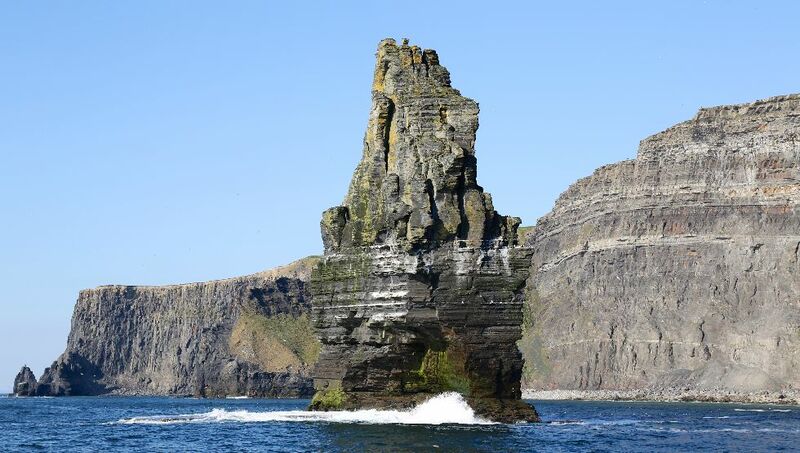 You can even take a trip to an island and combine it with a Cliffs of Moher Cruise on the way back to Doolin. This is the closest island just 30 minutes away and reassuringly visible from Doolin Pier. Some of its famous landmarks include the iconic Plassy shipwreck from Fr Ted fame, O’Brien’s Castle and stone age fort on the hill, and the white sandy beach with its crystal clear turquoise waters. If you can spare 5 hours, you have time to combine this with a Cliffs of Moher cruise on the way back. You still have time to take a Cliffs of Moher cruise . This departs 3 times a day (even more in high season) so you have no excuses! The sheer spectacle of the cliffs towering above the boat is an incredible, unforgettable experience. You will be treated to a spectacular live performance from thousands of birds who nest among the rocks, as they call to each other and dive for fish. 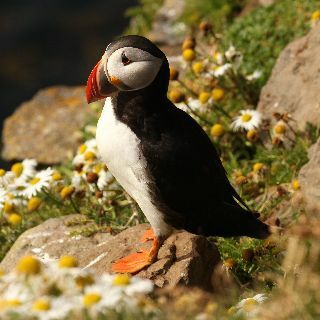 Look out for everyone’s favourite, the Atlantic Puffins, and also the famous sea cave that featured in the Harry Potter movie the Half-Blood Prince. Are These Trips Suitable For Everyone? 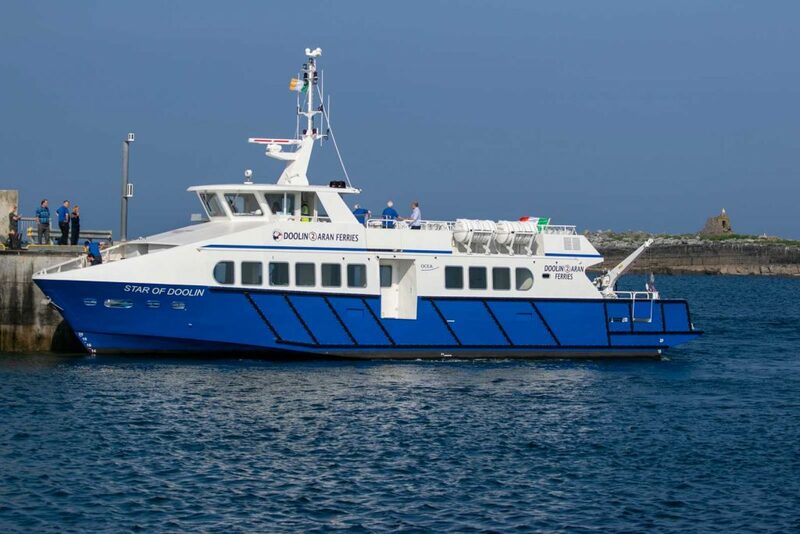 Our smaller ships take between 72 and 96 passengers each and our newest ship, the Star of Doolin, can seat up to 200 visitors. We welcome every age group on board, from 9 months to 90 years! There is a short gangway with grip rails to get on board, but then passengers can choose to sit for the duration of the trip or walk around. 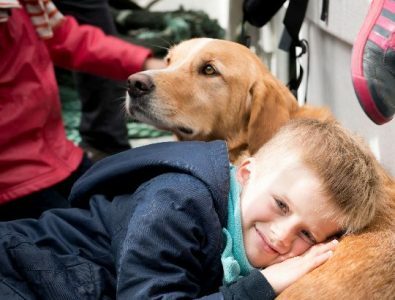 There is plenty of room for buggies and bicycles and even well-behaved four-legged friends like the ever-huggable Harvey. 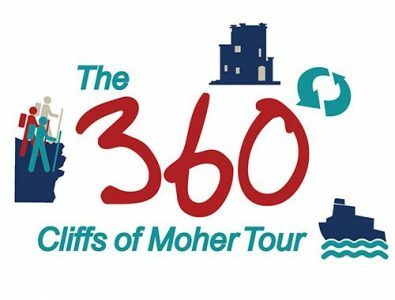 The 360 tour combines a visit to the top of the cliffs, a guided walk with Pat Sweeney along the edge and a cruise below the cliffs, literally covering all angles. Note: this experience will take approx. 5-6 hours in total. The company was set up in 1999 by four brothers from a local Doolin family – Donie, Eugene, Joe and PJ Garrihy. PJ was a fisherman out of Doolin for over 30 years. 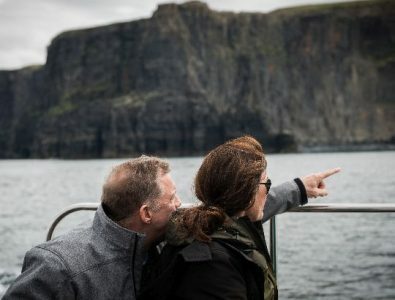 He saw an untapped opportunity when he noticed that while everyone seemed intent on bringing tourists to the top of the Cliffs of Moher, no one was providing them with a view from the sea. And so a business was born. 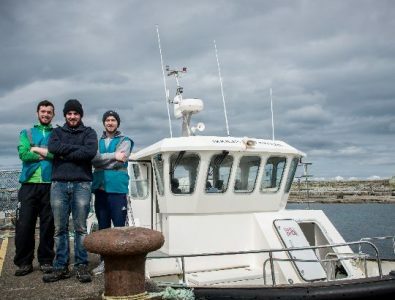 And now the tradition of this sea-faring and fishing family is being passed on to the next generation – that’s PJ’s son, Martin (left) and grandson Cian(right) next to young local skipper Jim Griffin . Our staff and crew all live here in Doolin or on the Aran Islands and many have been working with us since we started the business in 1999. Like all good Irishmen, these lads love to talk – our crew are passionate about sharing their knowledge and love of the cliffs, the birds and the islands with our passengers, so be prepared to listen and learn! 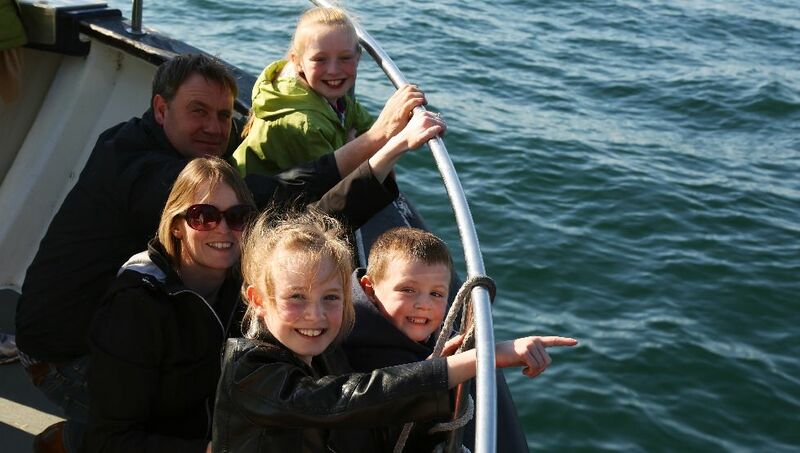 We work hard to make sure our customers make the most of their boat trips and we are delighted to share some of our passengers’ comments with you. 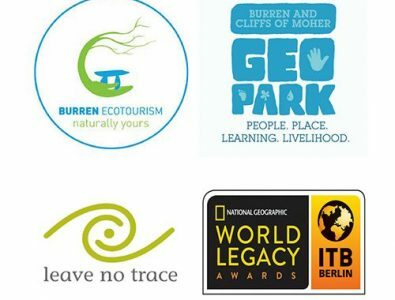 As a ferry company and proud members of the Burren Ecotourism Network, we acknowledge our responsibilities for protecting and enhancing the beautiful but delicate environment in which we operate. Come Sail with us, We would be delighted to Welcome You on Board!